Newly discovered spinning mechanism could inspire new materials. (Inside Science) -- Many people fear recluse spiders because of their venomous bites. But the bad reputation doesn't deter materials scientist Hannes Schniepp. He keeps dozens of the small brown arachnids in plastic cylinders in his Williamsburg, Virginia lab, where he studies the silk the critters produce. "They're actually very shy," Schniepp said of his wards. "We have handled the spiders for years without ever having any issue or incident." Schniepp, an associate professor at the College of William and Mary, and his colleagues recently discovered that the spiders spin their silk in a special way, looping it like a person might coil a loose electrical cord. The loops, the scientists found, make the silk more stretchy and tough. The results appear today in the journal Materials Horizons. Close to 100 species of recluse spiders live around the world. 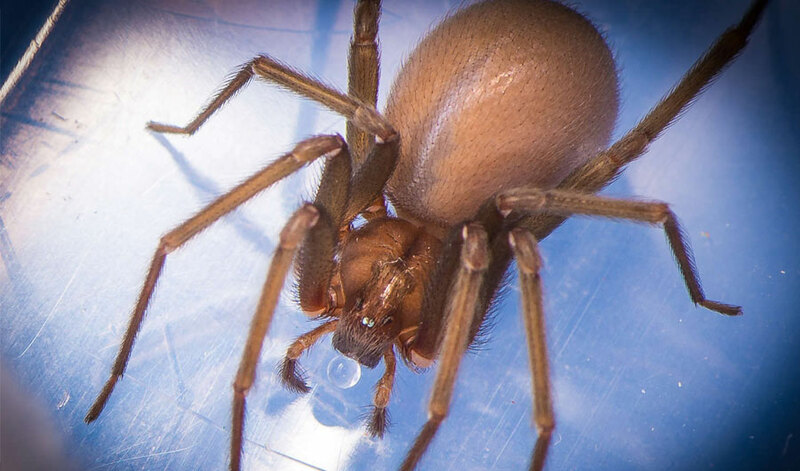 In the U.S., the brown recluse hides in dark places like basements and under porches in some Southern and Midwestern states. It is known for venomous bites that can send people to the hospital, although some spider specialists argue the risk is exaggerated in the popular imagination. Schniepp studies Chilean recluse spiders, which are slightly larger than the brown recluse. Recluse spiders don't spin elaborate webs of the spokes-and-spirals kind. Their silk looks more like messy clumps strung together with thin threads. Each individual strand resembles a flat ribbon, less than 100 nanometers thick -- a unique shape for spider silk. It was the fuzzy nature of the silk as it accumulated on the end of the spiders' abdomens that first attracted the attention of Schniepp's graduate student, Sean Koebley. When the researchers looked at the silk ball under a microscope, they noticed hundreds of loops arranged in piles. A close-up shot of the spinnerets of a Chilean recluse spider as it loops its silk. The video has been slowed down. They also took high-speed video of the spiders skillfully pulling, coiling and clamping the silk up to 15 times a second with specialized organs called spinnerets, almost like they had a "built-in sewing machine," Schniepp said. "We've spent hours staring at spider butts," he joked. When a scientist in the lab or a cricket struggling to get free tugs at the silk, the loops start to come undone. Every time a loop opens, the silk relaxes a bit. The "hidden length" stored in the loops, and the cycles of stretching and relaxing it creates, makes the silk able to absorb more energy without snapping -- a property materials scientists call toughness. The researchers tested the concept with looped strapping tape. Adding a single loop to the tape increased its toughness by 30 percent. The research is a "beautiful piece of work," said Vladimir Tsukruk, a materials scientist at the Georgia Institute of Technology in Atlanta, who was not involved in the project. "The general attitude toward silk fibers is that they are great, and they have very good strength. But people don't usually pay attention to the fact that they can be brittle," he said. The loops in the recluse silk solve the brittleness problem by adding toughness without sacrificing much strength. While the idea of loops adding toughness to materials is not surprising, the way the flat shape of the recluse silk helps form the loops is intriguing, said Todd Blackledge, a biologist at the University of Akron in Ohio, who specializes in spider silk and was not involved in the study. "Probably the most interesting and surprising conclusion is the idea that the ribbon shape of the silk plays a really key role in letting it make these sacrificial loops without compromising the quality of the material itself," he said. Other researchers have tried to enhance the toughness of artificial fibers by adding loops, but found that the unraveling of the loops can damage the material and decrease its strength. The loops in recluse silk are held together by attraction between the molecules on either side of the junction -- the same way geckos' feet stick to walls. Called van der Waals forces, the attraction only works when two surfaces are extremely close to each other. The flatness of the silk provides a good contact area so the junctions are strong. When the loops do eventually come apart, the flexibility of the ribbon shape helps ensure that the silk doesn't crack or break, Schniepp said. The next step toward practical application of the findings would be to create a synthetic fiber that mimics the key properties of the recluse silk's sacrificial loops, said Schniepp. Uses could range from bendable body armor to protective netting to parachute cords. And going forward, recluse spiders might start to get more positive notice from scientists. Up to now, said Blackledge, the "white lab rats" of the spider silk world have primarily been black widows, golden silk orb weavers and garden cross spiders -- animals that spin relatively large, cylindrical strands of silk. "It was really nice to see the attention paid to [the recluse] spider," he said. Catherine Meyers is a deputy editor for Inside Science.